Sangria Recipes: What Makes This Spanish Wine-Based Cocktail So Popular? Sangria is comparatively a new concept in India. It wouldn’t be wrong to say that it was popularised in Mumbai by the folks at Pali Village Café​,​ a restaurant that serves only wine. As soon as it was introduced in the menu, it instantly became a hot favourite with guests who were new to wine and for those who preferred their beverages​ fruitier and sweeter. From then on, every single restaurant or bar ​​began to serve up their own versions of Sangria. We also have a company in India that sells pre​-mixed sangria in screw cap bottle​s. The origin and history of sangria actually goes back hundreds of years. Sure, this beverage first made its delicious debut in America at the 1964 New York World's Fair. However, the inception of this drink dates back to medieval times. While understanding sangria's family tree, many wine enthusiasts actually point out to a drink created in Europe known as hippocras which was one of sangria's earliest and most direct ancestors. It's no secret that water in the middle ages wasn't just unsavoury. It was actually unsafe for human consumption, making wine a go-to beverage of choice for people of all ages and in every social class. While people relied on the alcohol in wine to stay off any residual bacteria, nothing said that they couldn't create a drink that actually tasted good too. Based on whatever happened to be in season, peasants and the wealthy alike would add harvested fruits, berries and spices to the hippocras for a lively final product that constantly had a different and unique flavour to it. 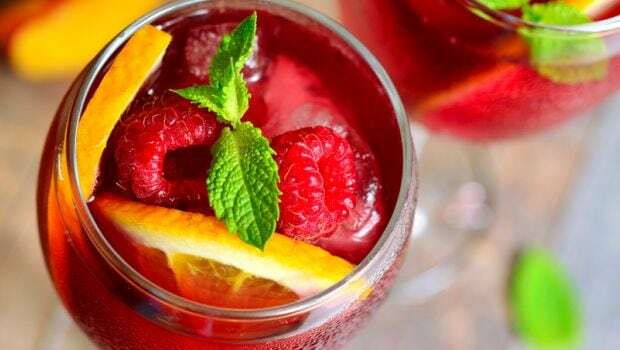 And so began the benchmark for the more traditional sangria drink that swept throughout Europe through the 1700’s and 1800's before eventually making its way to the US in the 1960's. 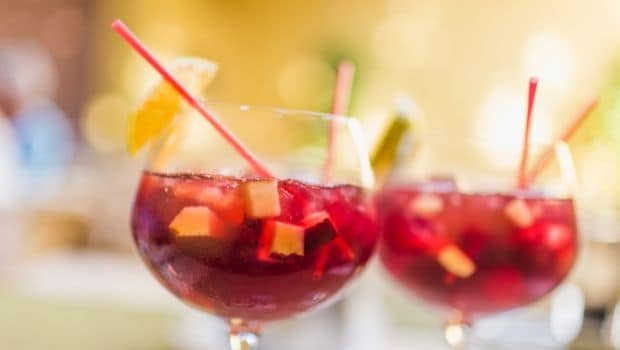 Additionally, the term sangria itself stems from a universal phrase coined by ancient Spanish villagers to describe all variations of this delicious concoction. While traditionally a red wine only beverage, modern times have brought with it the onset of white, and even sparkling sangria recipes. The wines that can be used are almost as endless as the number of recipes available for this fruity punch. For those looking to capture an authentic Spanish drinking experience, try using a wine grape varietal called Tempranillo from Rioja in Spain; however, virtually any red or white varietal coupled with soda water, sliced fruit, fruit juice and the occasional splash of brandy work. 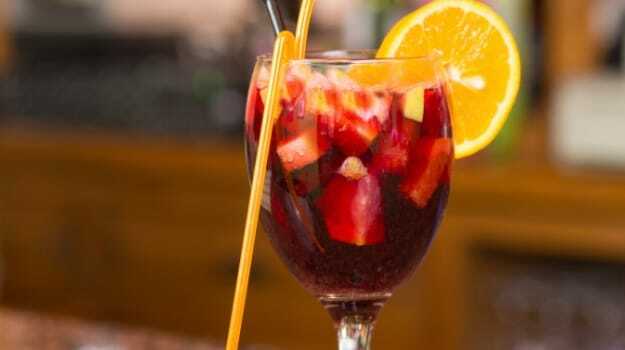 The new trend now is to use already made, authentic sangria from Spain. This sangria is made of grape wine, with natural and artificial flavours. It comes ready to drink and you can just freeze it, mix it with ice and add fruits and soda water. I find that sangria has become very popular with people who wouldn't mind having a drink during lunch or a Sunday brunch. It is a fruity version of wine and perfect refreshment on a hot Sunday afternoon. 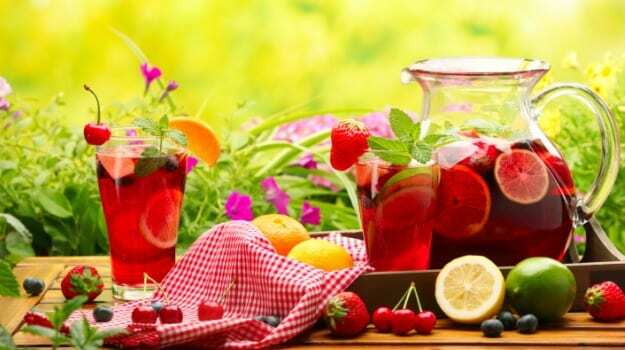 Sangria can be made with red wine, white wine and even sparkling wine by adding fruits, juices and even brandy depending on the kind of sangria you would want to make. An advice would be to allow the fruits and wine to be kept overnight in the fridge helping the flavours of fruit and wine to bond. Also, very important and often over looked by most restaurants is the quality of wine. Even when using it simply as a base, it becomes ​incredibly important to use good quality wine to make your sangria. I’m definitely not asking to use top end wines in the mix, that would​ just​​ be sacrilegious, but to use wines that you would not mind drinking​ on their own. I would recommend wines that are fruity or even floral in nature like Chenin Blanc or Viognier in whites or Zinfandel in reds. 1. In a large pot or bowl, combine the wine, brandy, orange juice, and sugar and stir until the sugar dissolves. 2. Add the lemon slices and apples and refrigerate for about one hour. 3. Remove from the refrigerator and add the soda. 4. Serve in a wine glass over ice. 1. Put the citrus fruit slices and segments in a pitcher. Add the honey and orange liqueur, let macerate for at least 30 minutes. 2. Add the chilled sparkling water, moscato wine, lemon juice and ice. Mix well. 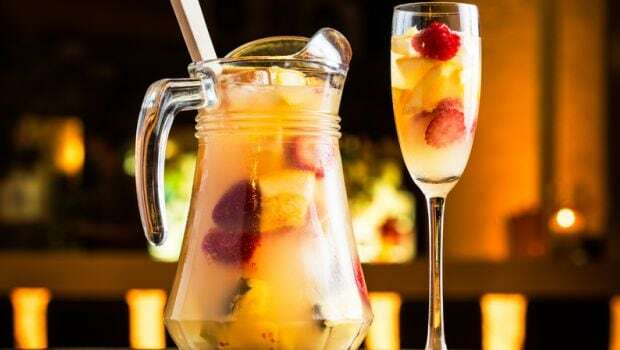 The citrus moscato sangria can be served immediately or kept refrigerated for a couple of hours before serving. 3. When serving the sangria, use a spoon or fork to put some of the citrus pieces into each glass.